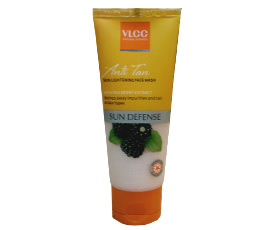 Buy VLCC Anti Tan Skin Lightening Face Wash with mulberry extract. Washes away skin impurities and skin tan. This unique foaming face wash deep cleanses the skin and effectively washes away impurities and tan. Ideal for dull and tanned skin. It's purifying properties leave skin refreshed and oil free. Enriched with mulberry extracts, it provides an even skin tone and deep cleanses the pores leaving skin fresh and tingling. Take appropriate amount and apply over wet face and neck with light circular movements using fingertips, generating lather. Rinse with water. Mulberry Extract, Kiwi Fruit Extract, Vitamin C, Honey, Allantoin, Decyl Glucoside.